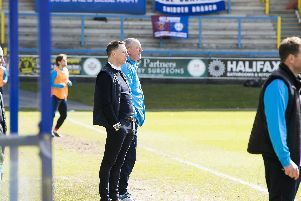 Lois Maynard scored for the second time in two games as his dramatic added time equaliser earned FC Halifax Town a point against table-toppers Barnet at the Shay. Curtis Weston had scored at the Shay for the second season running and looked to have given Barnet all three points. But for the second game running, Town got a hard-earned share of the spoils against the side top of the Conference. By quirk of fate and fixture list, Town hosted the table-toppers for the second time in four days, but met the challenge head-on with a committed display. Town went into the game without a win in five league matches for the first time since going six without a win between January 1 and February 1 last year. Not that you’d have known it as Halifax produced another wholehearted display against a side with more away wins and away goals than any other team in the Conference. Neil Aspin emphasised how pleased he was with the performance in Saturday’s draw with Bristol Rovers by naming an unchanged line-up. And it was a similar blueprint here. Again, like Saturday, detecting which side was top of the table wasn’t easy. John Akinde, by far and away the league’s top-scorer with 27 goals and six in his last seven appearances, was an obvious focal point for Barnet attacks. Marc Roberts will have painful memories of Akinde’s superb display against Town for Alfreton last season, but the Barnet forward tried to avoid a battle of the giants as much as he could, staying close to Graham Hutchison, presumably under Martin Allen’s instruction. Sunday’s rugby game had certainly left its mark on the pitch, with the omnipresent mud even disguising the long streaks of sand. On such an unreliable surface, Akinde and Richard Peniket were the main targets of lofted passes forward, although a beautifully-weighted through-ball by Mauro Vilhete picked out Weston, but Matt Glennon rushed off his line to block the shot. Aspin said he was particularly happy Town had scored from a set-piece on Saturday, and the hosts looked a threat from dead balls again, with only the bounce of a ball and some desperate Barnet defending preventing them connecting with early corners and Roberts long-throws. The Shaymen forced a seemingly-incessant run of corners midway through the first-half and somehow failed to score from them, with Peniket twice denied by Graham Stack from close-range. If Halifax had tired towards the end of that game, they didn’t show it, making most of the early running and setting a good tempo. Chances may have been few and far between but there was no shortage of effort, with Lois Maynard producing some superb interceptions and Roberts his usual towering presence at the back. While Akinde cut an isolated figure for The Bees, Peniket had a header saved by Stack from an excellent cross by Scott McManus. The Town forward was doing the work of two men up-front, pressurising the Barnet defence and pouncing on wayward touches. Weston’s early effort was the sum-total of Barnet’s first-half until sloppy defending allowed Vilhete a sight of goal, but his drilled shot crashed back off the far post. After such a positive first-half, that would have been a sucker-punch, but served as a reminder of Barnet’s threat, with Allen’s side only failing to score in one of their last 14 matches. Akinde got a rare sight of goal just before the hour mark but fired straight at Glennon after latching onto a hopeful long pass. That preceded a stinging shot by Sam Togwell that Glennon tipped behind, with Barnet offering evidence of a more even second-half. The Town boss will have been wary of his side tiring as they had on Saturday, and one or two Halifax legs will have felt more leaden when Weston headed in a corner with a quarter of the game to go. A pitch consisting of more mud than grass isn’t conducive to chasing a game, but Town responded well to the setback, with substitute Jack Muldoon bringing a fine save from Stack and Peniket only denied a clear chance by a last-ditch tackle by David Stephens. Muldoon then blazed over when well-placed, but time was starting to run out. Stephens was sent-off in added time for a crude challenge on Matt Pearson after a superb run from the midfielder that earned the Barnet man a second yellow. From the resulting free-kick, Peniket’s effort came back off the post before being scrambled in by Maynard for his 11th goal of the campaign. The drama didn’t end there as Barnet boss Martin Allen incurred the wrath of the home supporters by trying to run down the clock as Town attempted to get the ball back for a throw-in near the dugouts. Halifax: Glennon, Bolton, M Roberts, Hutchison, McManus, Smith (Muldoon 64), Maynard, Pearson, Marshall (Hattersley 88), Jackson, Peniket. Subs not used: Senior, Williams, K Roberts. Barnet: Stack, Yiadom, N’Gala, Stephens, Muggleton (Cook 58), Vilhete, Togwell, Johnson, Weston, Clifford (Gash 46), Akinde (Saville 90). Subs not used: Cowler, Villa.